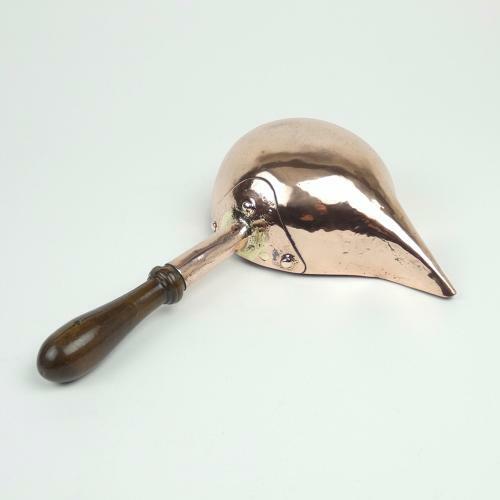 A nineteenth century, French copper sugar spinner. These items were used for making elaborate sugar decorations. Caramelised sugar was poured through the narrow spout to make items such as sugar baskets and nests. This one has a particularly long and narrow spout and a turned wooden handle. It is a very decorative example and it dates from c.1860. There is some pitting to the copper, from use, in the base of the bowl of the spinner, and the wooden handle, which is turned from a fruitwood, now has a few splits.